Valentines Day is right around the corner. You could give your sweetie cupcakes, chocolate, or even flowers, but how about giving them all of those in one. 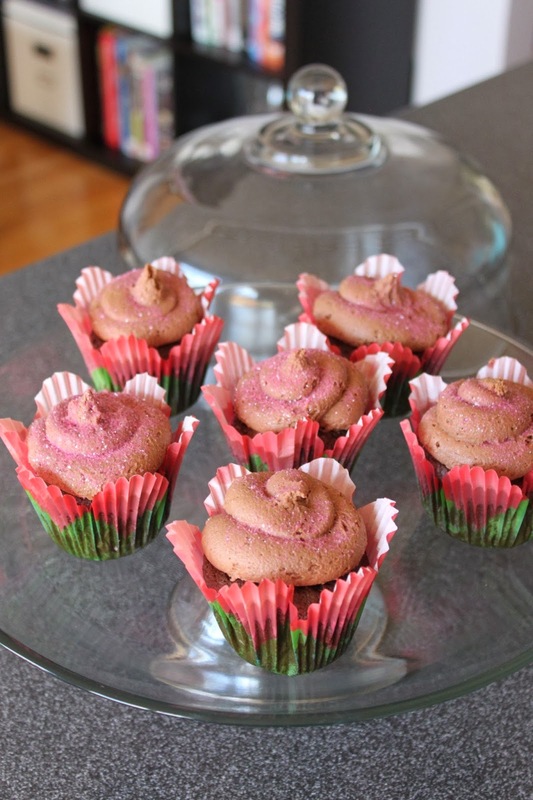 These are double chocolate cupcakes with Chocolate frosting lined in adorable flower wrappers. I must admit that I did not actually make these for Valentine's Day, I made them for a friend when she delivered her sweet baby girl, but since I never got around to posting them i figured they would be perfect for Valentine's Day. The cake recipe uses a box mix (I know, hate if you want), but they are incredibly moist and delicious and easy to make. Now I want one! In a large bowl, mix together the cake and pudding mix, sour cream, oil, eggs, vanilla extract, and espresso dissolved in water. Gently stir in the chocolate chips Bake for 20 minutes, or until top is springy to the touch and a wooden toothpick inserted comes out clean. Cool completely before frosting with chocolate frosting.